Excellent sounds, but I would like it if we see them through lock-screen like my songs and audio books! There are countless choices for mixing sounds, music, ambient sound in my office. I can Taylor them to my clients’ needs. Takes a bit to figure out how it works, but worth it. Seemed great until I noticed that it needs access to the camera to run or else it crashes. I tried enabling the camera to start the app and then disabling, but it crashes as soon as I select a sound to play. The same thing happens if I disable camera access after starting a sound. Poor software development - I'll be looking for another product if this isn't corrected. Since the last update, the downloads no longer work. This used yo be a great app but it seems like the developers have lost interest. This is s paid app I've enjoyed using for a long time and the last update has made it impossible to customize the menu to add timers. App freezes and needs to be restarted and the menu reverts to useless. Looking forward to the fix. Please update to provide iOS 8 compatibility! Wait to buy if you're currently using iOS 8. Good quality sounds. Nice to be able to blend! Updates have improved the UI. Tons of sounds. Worth the investment. This app no longer works. I've used it every night for about a year without any problems. As usual, every time the Apple people "improve" the os, many things begin to crash. Hey Apple - there's some wisdom which has been around hundreds of years, before ya'll were born: "if it ain't broke don't fix if". As soon as you fix something which isn't broke, it immediately becomes broken and no longer works. What's up with the camera? It's true, it crashes when you block access to the camera. After I went to iOS settings for this app and enabled access to the camera it worked again. I now put masking tape over the camera when using, and disable camera access in Settings when not using. Crazy, I know. Not sure what this app is doing with our cameras. I love this App. It helps me slow down and refocus. I use it to fall asleep at night, at work when things get crazy or just to sit with a cup of tea on the porch. The mixer feature is great to bring back memories of the sounds from my hiking trips. I highly recommend it. I like the nice design of this app. Plus, there's plenty of great, high quality sounds. One feature I'd like to see added is the ability to delete specific sounds. Otherwise this app takes up a lot of space. The soothing sounds are great for relaxing after a trying day at work or putting young ones to bed. Love the unique choice of sounds. 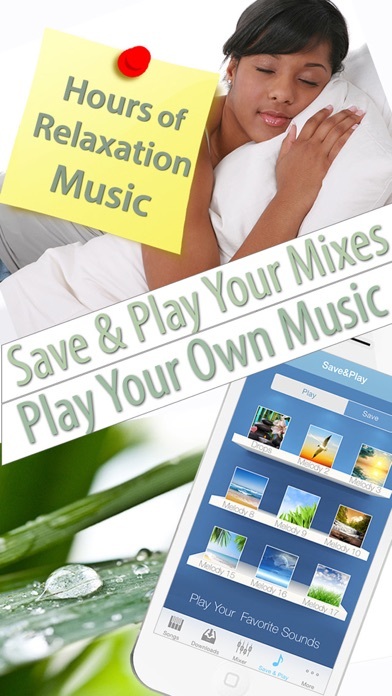 Creativity and relaxation in 1 app! I enjoy being able to make my own mixes and naming them. I can relax to what I find to be relaxing rather than something pre-decided by someone else. Very good choice of sounds and melodies to choose from. This app is amazing, it has been with me for years now. Whenever I would feel sad or depressed, I would listen to all the different kinds of melodies and just close my eyes listening to it. I love this app, it is beautiful and it really does make life better. 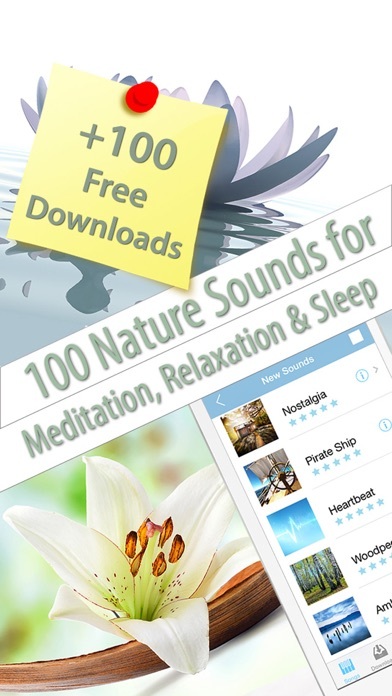 Most relaxing sound app -- use it every day. Since the last update the in app downloads never work. That was the reason this app was above the rest, not any more. I restore purchases, yet I have nothing in my downloads. No Need for Camera Access! This was my favorite app. I am disappointed that I purchased the app and in app purchases only to find that it no longer works unless I give access to my camera. Why would it need my camera!? Boo to the new version! I have enjoyed this app for quite sometime. It has been through some good updates in the past and it just keeps getting better and better that I eventually decided to buy the full version. So I have figured out a workaround to fix the app in iOS8!! You have to go under privacy, Camera, and then enable the app and it will work. If you're like me you probably blocked it because it seemed unnecessary. But I've had success on my iPhone 6 and my iPhone 5. Since the new iOS 8 update, the program no longer works. Please provide update! This is by far one of my favorite apps but crashes upon opening since I switched to iOS8. With it functional if give it 5 stars. As I can not use it at all now, 1 star. Relaxing and so easy to manage. I have had this for years and have always come back to it because there is so much it has to offer you! 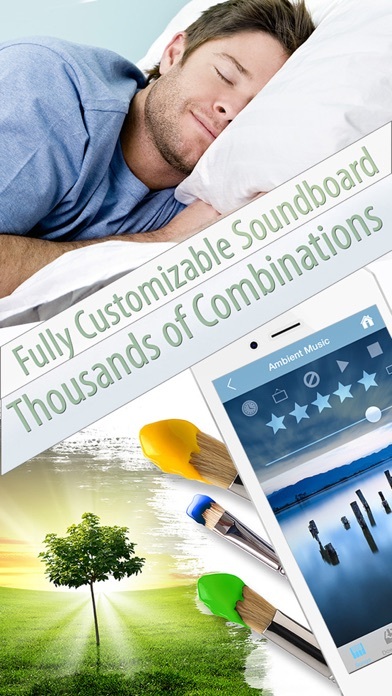 Aside from the relaxing impact of these sounds, this app is great in the variety it provides. You get about 8 different beach locations. That way you can find the one that sounds most like the beach you're familiar with. Same for all other categories. 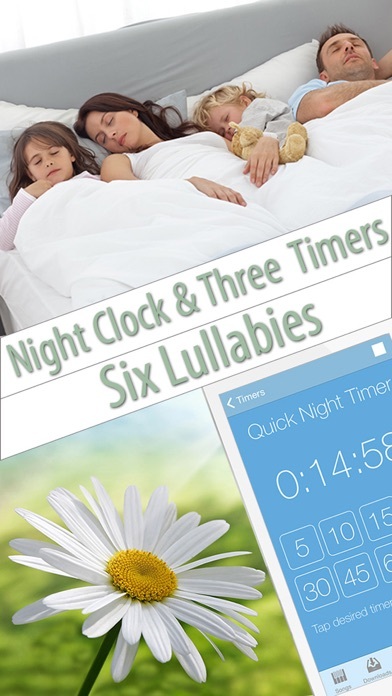 Great alarm clock and sleep timer options! I love this app, but I wish I could delete the sounds That I don't use. The amount of space this app uses is kind of absurd and I think if I could choose the sounds I wanted then it would free up some space. This app requires access to the camera for no reason!! If you disable Camera access in privacy settings, the app crashes. If you enable camera access, the app works. This app should not be accessing the camera. What are the developers doing with the camera data!? Freaky. Otherwise the app looks really nice, but I am not going to use an app that is accessing my camera for who knows what. On the latest iPhone update. Keeps crashing. Uninstalling this app. Worked great until Saturday October 4th. Crashes when attempting to open. I love the quality and variety of sounds and would give this app a 5-star rating EXCEPT for the fact that every time the app is updated all the downloaded sounds become corrupt and I have to reload EACH sound one by one. This is incredibly frustrating. I've been using this app for years and I absolutely love it! So many sounds , there's something for everyone even when you're are in different moods. Helps me relax, sleep better and forget about stress. My husband is allergic to cat but the purr relaxes me so I can have the best of both worlds. Great job guys, thank you. I love this app. Well worth .99 cents. Rain on a tarp sounds just like I am camping in a tent and it's raining. It is the most realistic rain I've heard; most sound like static. App is wonderful. It lets me create mixes of sounds and adjust the volumes. Only improvement I would like to see is for them to add more owl sounds. Sound collection just randomly disappear, and the restore function does absolutely nothing. I like this app because it is awesome and it really helps me to relax after a stressful day and the sounds and music are soothing. Nothing like paying money for something that you can't use. Please fix it or give me my money back. I love all the options to choose from. Especially the ability to mix and save. Thank you for a great app! It seems the most recent iOS update isn't playing nicely with this app, I have uninstalled it/re-installed a few times and have had no luck. The app will start to load then you find yourself back on the main screen, something overlooked with the latest update I'm sure. Just wanted to see if anyone else has issues and let Apple know there may be a compatibility issue. Otherwise I love this app, plenty of sounds to mix-n-match or use the preset themes...go to sleep listening to it every night. The app does not work after the ios last upgrade, i reseted the iphone and still won't run. Please fix it!! I enjoy this app. I wanted to transfer it to my phone because my tablet isn’t working well and i couldn’t transfer, it anted me to pay for it again! One of my favorite apps. 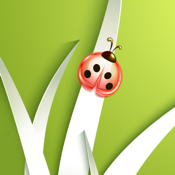 Use for sleep, background, meditation, and meditation support. Use daily. Highly recommend.